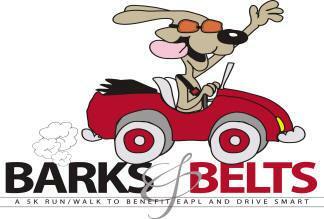 It's that time of year to mark your calendars and sign up for the 4th annual Barks and Belts 5K walk/run race in Evergreen! Our goal this year is 500 walk/run racers! We need your registration to meet this goal. Remember this event is for the KIDS and PETS! Sunday, June 7th come early, "Race Starts at 9AM" http://www.barksandbelts5k.org The event is held in Bergen Village in Evergreen, Chow Down 1260 Bergen Pkwy, Evergreen, CO 80439 The race starts and ends in Bergen Village. This is a timed event. On line registration at http://runningguru.com Dogs running with humans are free. Pre-registration guarantees a t-shirt for humans, a swag bag and a bandanna for dogs! No registration available on June 6th. Day of race registration opens at 7:30 am. Pre Packet Pick Ups are also on the day of the race starting at 7:30 am. Barks and Belts 5K is a benefit for Drive Smart and Evergreen Animal Protective League Tons of fun; DJ music, BBQ Food by Big Kahuna, Beer Garden provided by Cactus Jacks, vendor booths, pet adoptions, silent auction, prizes, giveaways, face painting, and more... Mark your calendars and make this a must attend family event (fur pets included)!